﻿ Athletic Bilbao 1-2 Real Madrid. Benzema to the rescue! 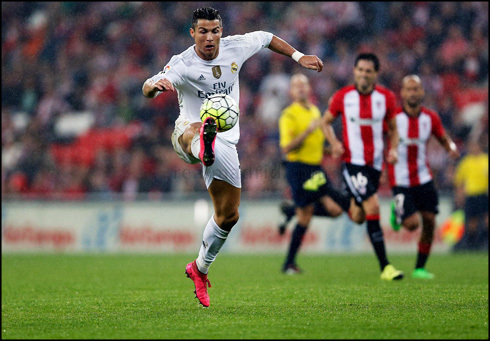 23.09.2015 » Athletic Bilbao 1-2 Real Madrid. Benzema to the rescue! Real Madrid brought home the 3 points from their trip to the new San Mamés stadium, after beating Athletic Bilbao 1-2 thanks to two goals scored by Karim Benzema. The Merengues are now on the top of La Liga, following Barcelona's 4-1 shocking defeat against Celta Vigo at the Balaídos. It couldn't have gotten any better than this! Real Madrid came out of San Mamés with a 1-2 win and the 3 points in the bag, but also witnessed their biggest rivals Barcelona being thrashed 4-1 against Celta Vigo. Rafa Benítez's men didn't let this golden opportunity slip away from their fingers and are now leading La Liga, right next to the revelation side so far, Celta de Vigo. In Bilbao, it was Benzema who stepped up to make sure that no points were going to be dropped. The Frenchman scored twice and completed his 5th consecutive game where he finds the back of the net. Cristiano Ronaldo played the full 90 minutes, but just like it happened last season, he would finish the game without scoring. With Luka Modric commanding the troops in the center of the field, the visitors didn't show any fear of getting dirty in the San Mamés' mud and basically brought the fight to Athletic in their own backyard. Upfront, Karim Benzema was the one who stood out the most and even ended up finishing the game with more shot attempts than Cristiano Ronaldo himself. 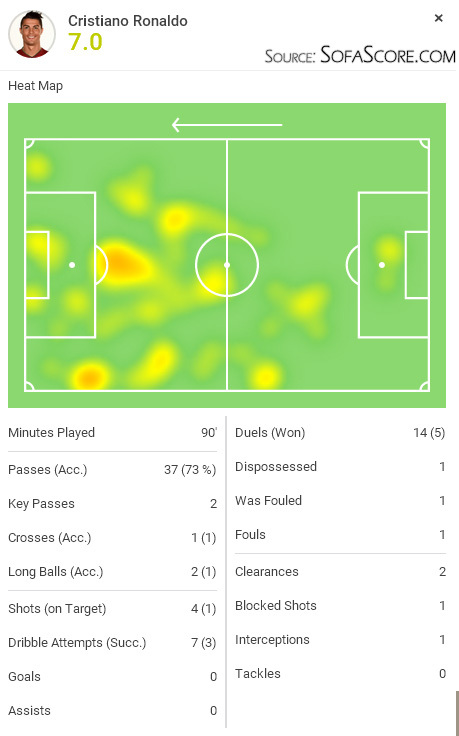 Quite a remarkable fact, since the Portuguese star had 8 strikes against the Frenchman's 9 attempts, as we can see from their individual stats kindly provided on SofaScore game page. The opener arrived around the 19th minute of the first half and it took place in a quite unusual manner. Right after Athletic had earned a goal kick, Iraizoz opted by passing it short to his teammate in front of him, who was just waiting for it outside of the box. San José, the defender in question, was immediately pressed by Ronaldo and decided to pass it back to his goalkeeper in order to avoid taking any risks. What the Spanish midfielder wasn't counting on, was that Benzema was already chasing that void left between him and Iraizoz. That attitude allowed him to reach to the ball first and with an easy touch he easily put Real Madrid on the driving seat for the first time on the night. It didn't take them any longer than 3 minutes though, as Isco exploited a true highway on the right wing and handed Karim Benzema his second goal of the night in a silver plate. Ronaldo was arriving right behind him, but the French striker is on a very hot streak these days and let's say that he just took matters in his own feet. From that point on, Real Madrid didn't let go their valuable lead and managed to hold back Athletic until the referee's final whistle. The Merengues are now for the first time in the season on the top of La Liga, but there's no time to celebrate anything at all as they're already hosting Malaga in another fixture, this Saturday afternoon. Attackers: Kovacic, Cristiano Ronaldo, Benzema. Cristiano Ronaldo next game will be for Real Madrid on the 26th of September of 2015, against Malaga. You can watch Juventus live stream, Real Madrid vs Malaga, Barcelona vs Las Palmas, Manchester United vs Sunderland, Tottenham vs Manchester City, and Leicester City vs Arsenal, all matches delivered in our streaming football section.